WASHINGTON, D.C., Aug 21, 2018 (SEND2PRESS NEWSWIRE) — The American Council of Engineering Companies Business Insurance Trust (BIT) and Greyling/EPIC Insurance Brokers & Consultants announced today leadership changes within the Trust as well as new Trustee appointments. Current Trustees Robin S. Greenleaf, P.E., LEED AP, Robert A. Overfield, P.E., and Michael D. Klingner, P.E. have assumed new leadership roles for the ACEC BIT. Robin will serve as Chair of the BIT Trustees, Robert as Vice Chair, and Michael as Treasurer. Former Chair Gary Loesch, P.E., DEE, will remain involved with the Trust as Trustee Emeritus. Additionally, Armando Ramos, P.E., LEED AP and Richard Humann, P.E., have been appointed Trustees for the ACEC BIT. “We are very pleased to welcome new Trustees Armando and Rich. With their extensive experience in managing engineering firms in California and the northeastern US, they bring a balanced perspective to the Trust and a thorough understanding of the risks and challenges facing engineering firms today,” said Robin. Armando Ramos is President of Ramos CS, a multi-service infrastructure consulting firm specializing in engineering, program, and construction management. Mr. Ramos has over 22 years of experience working on large-scale transit and transportation systems, international airport expansions, and federal and municipal facilities. Mr. Ramos started his career as a Structural Engineer, where he was responsible for the design of several federal facilities and structures, including the Metro Gold Line underground tunnels and bridges in the Los Angeles area. Armando has held many ACEC leadership roles, with his most recent being ACEC Los Angeles President (2018-2019). Mr. Richard Humann is Chairman, President, and CEO of H2M architects + engineers; H2M Associates, Inc.; and H2M Architects & Engineers, Inc., where he first started as an engineering intern in 1987. Rich became the CEO in 2013, and since been responsible for the overall performance of the firm, driving the corporate mission, vision, and values of the firm to create a working environment that promotes growth, engagement, and positive culture. “Building sustainable communities since 1933” is H2M’s mission, marshalled by Rich in how he motivates and encourages all employees to make sustainable design the foundation of the firm. Rich sits on several charitable, business, and academic boards, including the Engineering Advisory Boards at Stony Brook University and the New York Institute of Technology, and the Corporate Advisory Board of Cold Spring Harbor Laboratory. The ACEC BIT is responsible for providing quality business insurance responsive to engineering firms’ unique needs, delivering exceptional service to ACEC members, and offering valuable and relevant member benefits. The Trustees strive to meet and exceed member firms’ expectations and are committed to helping the Program keep pace with changes in the profession. 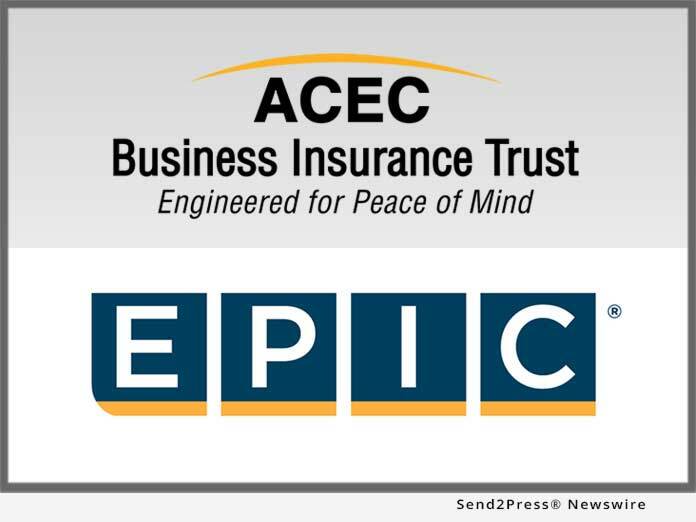 EPIC is a unique and innovative retail property & casualty and employee benefits insurance brokerage and consulting firm. EPIC has created a values-based, client-focused culture that attracts and retains top talent, fosters employee satisfaction and loyalty, and sustains a high level of customer service excellence. EPIC now has more than 1,400 team members operating from 50 offices across the U.S., providing Property & Casualty, Employee Benefits, Specialty Programs, and Private Client solutions to more than 20,000 clients.